cave system on Mt Arthur. Cavers exploring the bowels of Mt Arthur in Kahurangi National Park are on the verge of descending to record-breaking depths. 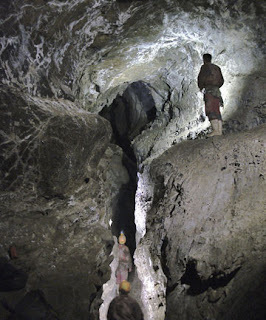 The four-member Extreme Cave Team's second exploration of the Stormy Pot cave system, below the high tussock slopes on the mountain's northern side, took team members to a depth of 575 metres. Team leader Kieran Mckay said the new system potentially dropped another 600m from the current point of exploration to where an underground river emerged into daylight. Last year the team broke the country's cave depth record by finding the first cave in the country to go more than 1000m deep. Mr Mckay said Stormy Pot had the potential to drop to a record-breaking 1200m. They exited the system late last week after a 14-day stint – five days of which were spent exploring the system from an underground camp. The system was made up of deep vertical shafts, silent galleries, chambers and a large river they have called the River of Clowns, he said. The team found Stormy Pot while seeking shelter from a storm this summer. They were eventually stopped 470m beneath the surface by a 10m vertical waterfall. The most recent expedition was made up of Mr Mckay, 43, from Waitomo, and his young team of Waitomo biologist Troy Watson and West Coasters Aaron Gillespie and Neil Silverwood. They were joined by Nelson caver James Alker for two days. Mr Mckay said Stormy Pot lived up to its name again with extreme rain and snow making conditions miserable on the surface. But once in the system the discoveries came fast and were truly world-class, he said. The team managed to bypass a second 50m waterfall and entered tall canyons, large round tunnels and huge chambers, discovering rare crystal formations and cave dwelling spiders on the way. They surveyed 3.5 kilometres of the new system and plan to return in June to continue the exploration of the River of Clowns. "This is an important passage as it is the main drain for the northern side of the mountain. The wind blowing down it indicates lower entrances. "Water emerges from the cave system in a large spring 3km away and over 600m lower down the mountain." The team's summer expedition, which was diverted because of the storm, was funded by a $10,000 Hillary Expedition Grant through Sport and Recreation New Zealand to further explore the Ellis Basin system in Kahurangi National Park. Mr Mckay said that while the team's success was due to the individual talents of the team, the results had been achieved quickly because of the Sparc funding. "Their grants have given us the ability to put New Zealand caving back on the world scene," he said.